I love the Life On Rides bike pump. It’s a great bike accessory to have, whether you bike daily or just for fun everyone once in awhile. This set comes with everything you need to be able to mount this to the bar on your bike. So to me this is such a smart idea and feature. I don’t know how many times I’ve been stranded somewhere without a bike pump and a flat tire. You can easily mount this to the bar and you will always have a bike pump with you. The pump works really well, it comes with the needle so you can screw it in to use with the pump. Insert the needle into whatever you are blowing up and then pull down on the silver pump and push back up. This begins the process of pumping air into the tire or other object. It’s really easy to pump, slides very easily. The needle fits well and inserts easily into objects. This is a mini pump so it’s more for emergencies then to blow up an item from completely flat. It is very convenient to have though if you get a flat and you need some air in your tire!! Solidly made, great quality products!! WHAT CUSTOMERS ARE SAYING: “Puts your mind at ease when you are going on a long ride.”, “Its so lightweight & easy to mount. I really can’t believe how quickly it works for being such a small pump”, “This pump appears to be one of the best ones I’ve purchased, compared to ones 3X the price!”. Read our raving 5-star reviews and see why your search for the best micro bike pump has ended! POWERFUL & EASY TO USE: This amazing micro bike pump gets you back up & riding within minutes so you’re never left stranded because of a flat tire again. 100 PSI capacity gives you enough power to inflate your bike tire during an emergency, or simply use it to keep the tire pressure up during long rides. Comes ready to use; no assembling required. PORTABLE, COMPACT & BUILT TO LAST – Premium CNC Aluminum Construction ensures this pump will last you a lifetime. Extremely small & compact design makes it easy to carry it in your pocket, or attach it to your bicycle so you’re always protected on the go (frame mounting kit included). Tight seals ensure there are no air leaks while pumping. Unlike most other pumps, it won’t cause wear & damage to your bicycle tires either. PRESTA & SCHRADER COMPATIBLE: Free instructional guide included with your purchase shows how to easily switch between Presta & Schrader valve in just minutes. Package also includes ball needles you can use to inflate soccer balls, basketballs & more! 100% LIFETIME SATISFACTION GUARANTEE: By now clicking the ‘Add To Cart’ button, you’re protected by our amazing 365 day no questions asked money-back guarantee & lifetime replacement warranty. Your complete satisfaction is our #1 priority. 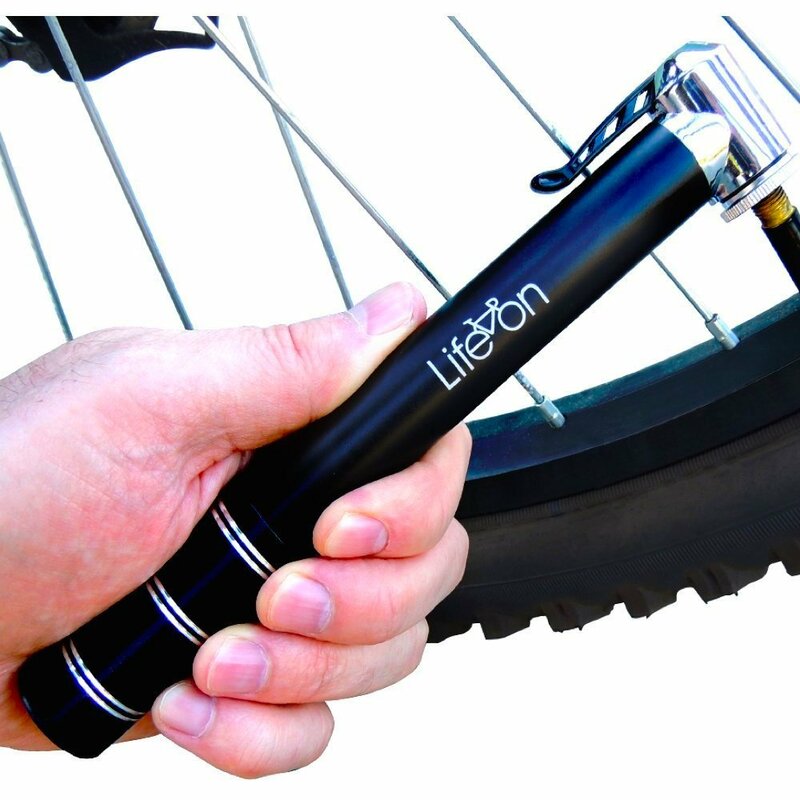 Order your Life On Mini Bike Pump today and see why so many cyclists consider this the #1 mini bike pump on Amazon!